Whether you like it or not, despite all the talk about email nearing the end of its useful life or that social media is soon to replace email, stats show that email is here to stay. Since there is no way to avoid emails, what we can do is become more efficient in email management. Gmail already comes with a set of great features itself, but there are numerous other tools out there that allow you to extend and enhance its functionality. Here is a list of the best Gmail add-ons for boosting your productivity and cutting down the time you spend managing your email accounts. Unroll.me is an extremely quick and easy way to manage your email subscriptions and cut loose from the ones you have no need for. Personally, I subscribe to a lot of newsletters from WordPress and the design industry. But I prefer to go through these emails once a day rather than being interrupted by newsletters throughout the day. So how do you separate these automated emails from the emails that are from your clients? Unroll.me is a free service that works with Gmail, Google Apps and Yahoo, and it’s pretty easy to setup. All you need to do is sign in with your email client, and in just a couple of clicks, you’re good to go. You can also combine all of your subscriptions into a digest called the Rollup, which appears in your inbox at the time you specify, every day. Boomerang is an extension for Gmail that lets you send emails later, set email reminders, snooze messages, and track emails that you’ve sent. Scheduling your emails can be very useful when you know the email reading habits of a potential investor or client (especially if they are in a different time zone). You can send them at a time when your client opens their email, and chances for your email to be on top of his/her inbox is huge. Boomerang also has a handy ‘snooze’ feature which I use occasionally. I have been practicing inbox zero for the last couple of years. But there are often some emails that don’t need any immediate action on my part. You can blame it on my slightly OCD-ish brain, I don’t like emails laying around my inbox. Previously I used to move such emails to a folder called ‘Later’, but there were a few occasions where I completely forgot about some of them. By using the snooze feature, you can have the important ones return to the top of your inbox at the specified time, when you have time to act on them. Google Contacts gives you some basic CRM power right inside Gmail, but when you need to track your messages and interactions, Streak is the next CRM you should consider. You can see quickly what needs to be followed up on, and make sure your messages are getting sent when they’re needed and read when they’re received. Streak is a perfect choice for freelancers and startups who want to enjoy basic CRM features but don’t want all the complex features of a full-blown CRM solution like SalesForce. Anyone can send you an email at any time. To get to these emails as quickly as possible, what many people do is keep their inbox open in one of their browser tabs, only to see if they have received a new email. This may be useful if your job requires it, but for most, it is just a waste of time and productivity. The Batched Inbox plugin is here to help you with this issue. This plugin stores all the emails that you receive in a folder other than the inbox, and then moves these emails to your inbox at your specified time. For instance, if you set the plugin to deliver emails to your inbox at 9 PM, all the emails that you get before that time will stay in a label and NOT in your inbox. When the time arrives, the emails get moved to your inbox so you can read them. Are you someone who obsessively checks your inbox 20 times or more a day? I used to do that, too. I was afraid to close my inbox. What if some urgent message from a client arrived? What if it is an alert from my site monitoring service saying that my websites are down? Then I came across a service called ‘AwayFind’. The idea behind AwayFind’s service is to keep you out of your email inbox by having their service send you urgent messages and things that are worth knowing about. The service will scan your inbox and depending on what filters you have enabled on the site, AwayFind will notify you of messages that you deem important through SMS, mobile push notifications, etc. 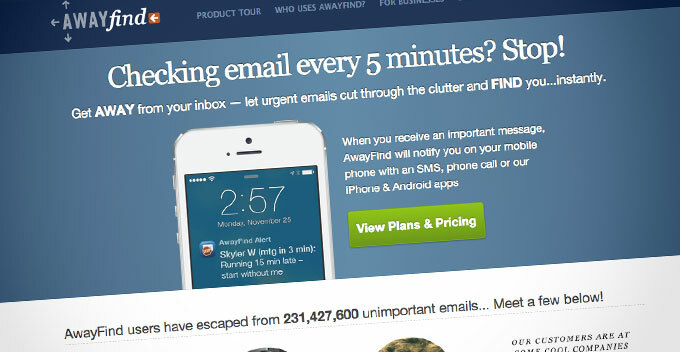 AwayFind’s service starts at $5/month for a personal email account. Gmail UI can look a bit cluttered at times. Gmelius gives you the option to regain some space and to clean your inbox by removing ads, the people widget, hangout statuses, Google+ activity, Gmail footer, etc. In addition to simply hiding certain elements, you can also customize the behavior and appearance of a few as well. For example, you can move labels and attachment icons from left to right, add text to navigation icons, such as ‘Archive’, ‘Spam’, ‘Delete’ etc., or apply a single font across the entire interface. Gmelius also offers a premium option that can be very useful for Gmail power-users. Sidekick, from HubSpot, is a chrome extension that will help you track and schedule emails. With Sidekick email tracking, you can get live notifications when someone opens or clicks a link on one of your emails. You can learn when, how many times, where, and from what device they opened your email. It also offers a great scheduling feature that allows you to send emails in the future. Sidekick, which integrates with HubSpot and Salesforce, can be a very useful tool for those who are working in sales. This service is free to start with, but you can only receive 200 send notifications (email opens, link clicks) per month. For $10/month, you can upgrade to Sidekick Premium, which will give you unlimited send notifications. Inbox Pause adds a Pause button to your Gmail, which when clicked will stop new messages from arriving in your inbox. The new messages will be held in a special label until you are ready for them. Optionally, Inbox Pause can also notify the people who email you to let them know that their message will not be delivered to your Inbox. When you unpause your Inbox, all of the messages that you received during the break will be moved to your Inbox, and new messages will arrive as before. Unless your job absolutely requires you to jump on emergency-level messages, you’d be better off dealing with emails in small “batches” at scheduled times throughout your day, rather than stopping what you’re doing to check new mail as it arrives. I was a big fan of Rapportive for years. But after the Linkedin acquisition, they stripped away many of the useful features which attracted me to it in the first place. So I was in search for a good Rapportive alternative and recently I discovered FullContact. FullContact for Gmail integrates with FullContact, a contact management platform built for individuals and businesses. By combining multiple address books and storing the associated information in one place, FullContact users can eliminate redundancy, pull up additional information from various social networks, and easily share their contact lists with others. The free version lets you manage 5,000 contacts, offers two-Way Sync w/ Google (every 24 hrs), can fix duplicates and “clean up” misspellings, etc. WiseStamp extension empowers your Gmail signature with IM & social profiles, links to your latest blog posts, etc. You can also ask it to automatically include even more information like your latest tweets and blog posts to make your signature a live and dynamic one – driving relevant traffic to your website. WiseStamp is free to use, with paid plans available offering additional features. The free version includes a link to WiseStamp in the signature. So these are my favorite Gmail add-ons. What are yours? Please share them in the comments.